The WM-10 Wandermeter is portable and suitable for field applications. VICOM has announced the new WM-10 portable Wandermeter, from Pendulum Instrument AB, a leader in time and frequency calibration, measurement and analysis. The WM-10 Wandermeter is used to measure the wander of the synchronisation clock in telecom networks, whether fixed or mobile. Excessive wander of the clock is one of the most common causes for traffic disturbances. If the synchronisation clock is too unstable, calls are lost, faxes will misprint and data must be repeatedly retransmitted. The wander measurements are graphically displayed as TIE, MTIE or TDEV on the built-in LCD-display. Wander measurements are made on the E1-clock (2.048MHz) or the data at the primary rate (2Mbps). The results are compared with the most common masks according to ETSI standards. New masks can be downloaded from a PC. Differential wander can be measured between two existing sync-clocks, e.g. incoming and outgoing 2.048MHz clock to a network synchronisation module. 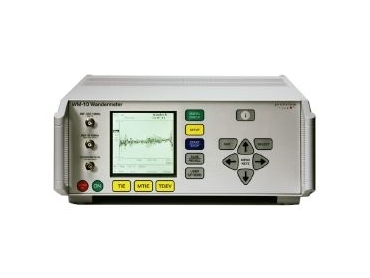 A 2.048MHz optional output can be used as a stimulus signal to a network element when trouble-shooting or as a reference to other measuring instruments or testers. The WM-10 contains an in-house developed high-resolution measurement kernel that compares the external sync signal under test with the internal Rubidium standard. The instrument has a bright LCD-dot matrix display and can communicate with a PC via its serial port. Its low weight (5kg) makes it portable and suitable for field applications, like trouble-shooting and preventative maintenance. Internal calibration needs no manual adjustments. The user only needs to connect a frequency calibrator (e.g. from a GPS-controlled Rubidium standard) and enter the calibration menu. After a few hours, the internal Rubidium clock is automatically adjusted to its nominal frequency.